My main Manifest Technoogy site hosts not only several hundred articles on digital media technology, but also includes resources on digital media and galleries of sample products. As part of the overhaul for the main Manifest Technology site, there are new Digital Media Galleries posted, including portable media devices, portable storage, and mobile communications -- plus home media and digital imaging. Plus a new Site Map showing the organization by Articles, Galleries, Resounces, About, and Publications. It's the best of both worlds for USB storage drives -- even more capacity, and shrunk to amazingly small sizes -- both at the same time! The Sony Micro Vault Tiny is now up to 4 GB (coming this spring, price TBD) -- in a design which is basically a memory card with a vestigal USB interface (but without the USB connector). 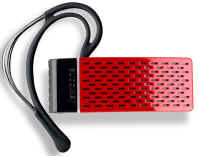 And the Kingston DataTraveler Mini with Migo is just large enough to hold a USB connector, with a sliding retractable protective cap. It's available with 1 GB for $15, and up to 2 GB. See more in the Portable Storage Gallery, under Flash USB Pocket Drives. Tired of carrying a bag of power adapters to charge all your electronic devices? A better answer is to carry one charger, with a collection of adapter tips to fit your specific devices -- cell phones, MP3 players, digital cameras, and other small electronic devices. But why even carry a special charger, when your laptop can charge devices through the USB connection? The MDI kwikSynCh Dual Charger ($14.95) takes that USB connection and splits it in two -- one cable for power and data (for example, to charge and sync your MP3 player or PDA), and a second cable with just power so you can simultaniously charge a second device. Just buy additional tips ($6.95) to charge all your devices -- saving weight (and money) compared to additional adapters. Even better this is all just standard USB -- the tips work with any USB cable, and MDI also offers wall and car power adaptors with a powered USB connector so you can charge without a computer. USB "thumb" drives with flash memory have reached 4 GB -- and for under $100. And if you need more storage, USB pocket drives based on tiny hard drives how now reached 12 GB -- a bit bigger then a flash drive, but still under a couple ounces. The Memorex Mega TravelDrive is now available from 4 GB for $119, to 6 GB for $99, 8 GB for $129, and 12 GB for $149. And the Verbatim Store'n' Go USB HD Drive reaches to 8 GB for $135, and 12 GB for $179, in an even smaller design. See more in the Portable Storage Gallery, under USB Hard Disk Pocket Drives. In 2007, trends that began developing last year are coming to fruition. Sites like YouTube and Google Video have exploded interest in informal short-form video, and low-res video thrives on portable devices from pocket MP3 players to cell phones. At the other extreme, in the living room, the home theatre high-def experience is coming into reach with affordable wide-screen displays, HDV camcorders, and next-gen DVDs. And new networking technologies allow even broader sharing, both between devices on the home network, and peer-to-peer across the Internet. The newest poster child for these developing trends and technologies is the latest Roxio Easy Media Creator suite, version 9. EMC 9 handles all different types of digital media (video, audio, photos, data) through the end-to-end workflow, from capture to editing to sharing. The EMC suite provides a nicely integrated collection with both strong individual tools, and a variety of utilities for doing simple things quickly and efficiently. It's easier than ever to create good-looking productions using consumer video editing software, turning your video into a nice movie production, complete with transitions between scenes, background music, title text, and fun video effects. And you can share movies as video files for computer playback, or post for friends to view over the Web, or download to a iPod to take with you, or even burn on DVD to watch in the living room. Let's walk though the video editing and DVD authoring process, using Ulead VideoStudio 10 to demonstrate some of the latest capabilities in these applications. VideoStudio uses a nice step-by-step approach in its interface, which makes it easy for beginners (and occasional users) to figure out what to do and how to do it. Hard disks have almost become the new floppies -- yet another form of swappable storage. External drives are great for auxiliary storage and backup, and even internal drives are loosening up -- you can swap them in slide-out trays, or mount them in drive kit enclosures from companies like ADS Tech, turning a bare internal hard drive into an external USB drive or even a networked drive. But mounting a drive in an enclosure is lot of hassle when you just want to quickly access its contents, whether to grab an old copy of a file or to transfer the entire contents of an old disk. NewerTech USB 2.0 Universal Drive Adapter -- available now for $24.95 (introductory pricing). Connect the wires, power up, and your bare internal hard disk drive now mounts as an external USB drive -- on Windows, Mac, and Linux. Newer Technology does warn that you should be careful running a bare internal drive without a protective enclosure in this way, and place the drive on a rubber surface like the bottom of a mousepad to protect against electrostatic discharge. See more in the Portable Storage Gallery, under Portable Hard Disk Drives. Microsoft kindly loaned me a Zune player for a couple weeks to demo at some local events. There's been a lot of discussion about the interesting decisions made for this product, including the exclusion of support for Microsoft's own Windows Media DRM / Plays For Sure format for purchased music, plus the Zune's limited Wi-Fi support for sharing music for a limited period. But I wanted to focus on the design of the player itself, and the playback experience, which is quite nice. Because of the relatively large screen for a handheld player, the Zune can be a great portable player for enjoying and sharing your own music, photos, and videos. Earbuds and headsets, earphones and headphones -- listening has moved beyond delivering sound to also cutting out unwanted noise. You can block some sound with in-ear buds or over-ear pads, and then go further to add in active noise cancellation to dynamically sample and reduce outside noise. 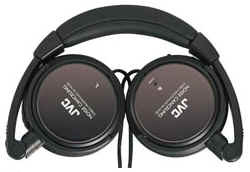 The new JVC Noise Canceling Headphones (model HANC80, $59) provide a great example of the kinds of features that are now available -- over-ear but still light and comfortable, foldable design for convenient travel, and a neat switchable option between wide (airplane) and low (train / bus) modes. SmartSound Quicktracks for Adobe Premiere -- free! SmartSound Software announced that it is giving away its Quicktracks for Adobe Premiere software as a free download for users of Adobe Premiere Pro and Premiere Elements (on Windows). Quicktracks is a plug-in that works within the Premiere timeline to automatically compose royalty-free music soundtracks, adjusted to fit the exact length of your clips. You search the available music by style, intensity, and other attributes, select a variation within the selected score, and then generate the resulting soundtrack for your production. The resulting score not only fits your timeline, but also is composed with a clear musical beginning and ending. The Quicktracks download includes ten royalty-free music scores, although SmartSound hopes that you then will be interested in purchasing some of its extensive music and sound libraries to generate different styles of audio for your productions. As a result, it also has put its entire collection of more than 90 Professional-Quality (44k) stereo music and sound effects libraries on sale for half price -- $49.95. Bluetooth headsets for mobile phones let you talk without wires, but at the cost of a possibly noisy connection for the person listening to you -- After all, you're talking out the side of your mouth to a tiny microphone in your ear. As noise-reducing headphones have become popular for listening to music, the same idea is now available for Bluetooth headsets, but with a new wrinkle -- the Aliph Jawbone Noise-Canceling Bluetooth Headset doesn't just improve what you're listening to, it also significantly improves the sound for the person you're talking to. For example, when I stood between cars on a moving train, or next to an industrial air compressor -- with overwhelming outside noise -- the Jawbone amazingly almost completely removed the background noise from the outgoing signal. You would think that computer-based video surveillance would be a no-brainer -- just point the camera outside and have the computer alert you when it detects anything interesting. But it turns out that "understanding" activity in outdoor scenes is horrendously difficult for computers. The world is full of complex motion, from trees and leaves blowing in the wind, to dramatic lighting changes from clouds passing overhead and shadows popping into view, to birds or other wildlife flashing through the view. As a result, simple motion detection with consumer cameras like the Creative Live! Wireless Internet Camera is best used to monitor static indoor scenes, and even professional intelligent video surveillance systems can generate many false and nuisance alarms. Even worse, setting up such a system for a large site becomes a messy logistical undertaking, requiring installation of the cameras and associated runs of cabling, plus establishing what is essentially an IT data center for the video and computer equipment required to monitor and process all that video. A Princeton-based company, SightLogix, Inc., has a better idea -- taking advantage of the relentless miniaturization of technology to move the intelligence into the cameras themselves. The camera then does the processing locally, taking advantage of all the detail available in the camera, and then requires only a low-bandwidth, even wireless, connection to report alerts. 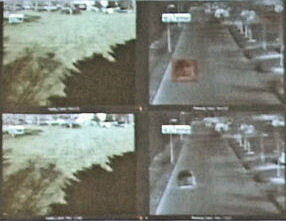 As a result, cameras can be deployed quickly around a site, and even run stand-alone with solar power. Entries posted to Manifest Tech Blog in February 2007, listed from oldest to newest.